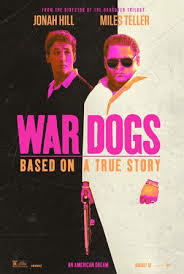 With more on its mind than its theatrical marketing campaign would suggest, War Dogs is director Todd Phillips’ Martin Scorsese moment, and it’s a grand one. With nods to GoodFellas, Casino and, especially, The Wolf of Wall Street, the Hangover helmer delivers a wild and woolly–and often hilarious—serious comedy involving high finance at high stakes with characters that are, well, often high. Miles Teller (Whiplash) is a good-natured, down-and-out Miami massage therapist who reunites with old Hebrew school pal Jonah Hill (Hail, Caesar! ), a boisterous hustler who lures him into his business of selling arms to the U.S. government during the Iraq War. As their business grows, so does Teller’s guilt about profiting from a conflict neither he nor his girlfriend (Ana De Armas, Knock Knock) support. At the same time, Hill has little remorse for the wheeling and dealing which eventually leads the two into precarious situations and, eventually, into contact with a dangerous international arms dealer (Bradley Cooper, Joy). Like the aforementioned Scorsese films, War Dogs chronicles the rise and fall of its protagonists at a gung-ho frenzied pace, with danger at nearly every turn. The yin-and-yang paring of the seemingly stable Teller and the perpetually wired Hill works wonderfully, as does the ambitious screenplay (based on a actual Rolling Stone article) that finds equal time for the pair’s edgy bromance and some deft asides on the warped mentality of military operations during the George W. Bush presidency and the hazards of the industrial military complex. War Dogs was something of a disappointment at the box-office, taking in $42 million, but will likely find its footing in its DVD and Blu-Ray release. It’s one of the happiest, most under-appreciated surprises of the year.